After making the Kissing Cousins skirt for my nieces on my side of the family, Clark and I thought that it was only right to make a few skirts for his cousins on my husband's side. Unfortunately, these are not accompanied with tutorials. The first skirt that we made was the June Bug Skirt, named after a certain little miss by the same name (not given, and minus the skirt). You'll recognize the fabric, as being the same as one of the Kissing Cousins skirts. Clark loved it so much, and I did too, that we thought we ought to make another skirt out of it. 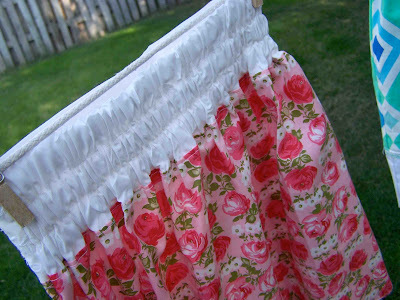 A big old bonus is that all of the material for this skirt came from Miss June Bug's great grandmother. The skirt is a basic A-line, with a ruffled side box pleat. I've been wanting to do a gathered box pleat for quite some time, and hadn't quite found the right application. I love the idea, but think that I ought to have added even more extra material for the gather. I ended up pressing the fabric to create a bit of a crushed gather. Jury's still out if I like it pressed. Perhaps I'll do a tutorial on this technique, any takers? 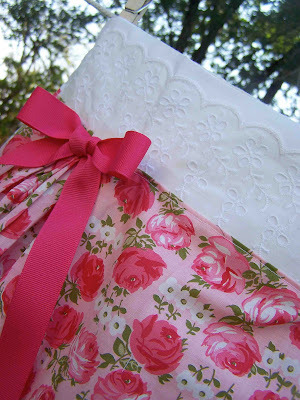 The box pleat was topped off with a grosgrain ribbon bow. The waistband is flat in the front, and gathered with elastic in the back. For the front, I added a bit of eyelet lace trim. I love this material, and it seemed like an appropriate garment for it. To attach the lace to the waistband, I added a bit of hem tape to the back, ironed it in place, and then stitched along the scalloped edge of the lace. I didn't have thick enough elastic for the waistband, so I ended up using three separate pieces of elastic, and creating a divided casing. I actually really like the effect. The skirt has two large pockets sewn into the side seams, I probably won't make a girls skirt again without pockets. The hem of the skirt was finished with a scalloped stitch. I finally found a project for that technique as well. 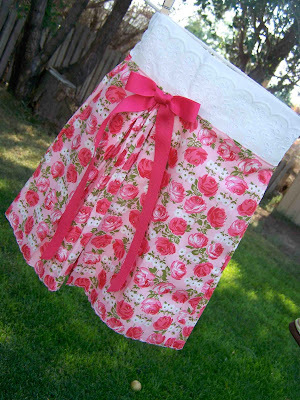 I am kind of in love with this skirt, and may have to make one in my size! Side Note: I am 95% sure that Clark married one of his cousins last weekend. We saw them standing together in front of the wedding reception backdrop, with an eight year old officiator between them. This is one of my favorites!! You should totally make one in your size! 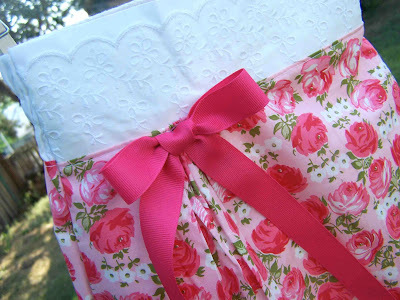 The pleats and the eyelet trim and the three casings and the pockets and the fabric are my favorites.